But hey…when your right, your right, RIGHT!? God’s hand is short with me..I don’t get away with much..not even when I’m right..because usually somewhere along the lines I MIGHT have been wrong. Sometimes it’s not WHAT we say, but HOW we say things. I ask myself…did I seek the Lord BEFORE I said anything? Was I too emotional when I confronted? Were the words that came from my mouth, the heart of God or fueled by frustration, anger, fear? I check my own heart and make sure it is right before the Lord. Sometimes our own need to be right can keep us in anger and fear…keeping us far from the person we offended and far from the heart of God. If you need help apologizing..(even if you are right) here is what I do..
Go to the offended and say I am sorry I offended you. PERIOD do you see that period there. No need to say more unless the offended would like to talk further…no need to justify our rightness. Please forgive me for my anger or fear. I’m sorry if you felt disrespected. I’m sorry if you misunderstood what I was saying. Please forgive me for not being more clear..
I’m sorry if my timing was off. Please forgive me. You know..we need to extend grace. Even if we are right. Only you can decide between you and God if you need to apologize. Every situation is different…but God definitely let’s me know if I DO need to apologize..no getting away with it for me. If I can be bold enough to confront, then I need to be humble enough to ask forgiveness…if I need to. Of course if I have done everything in my confrontation according to God’s will .. God’s will is always to restore another. Either the other person will be humble and repent OR be offended and angry. I need not apologize and I will just have to let it go to the Lord. Or I need to apologize …and I still need to let it go to God. We cannot control other people. 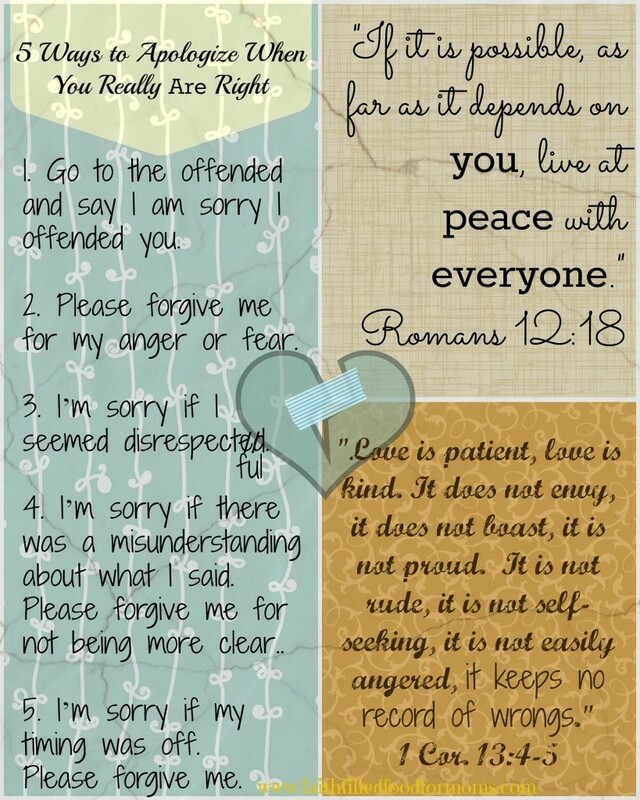 So even if we apologize and the other is still offended..give it to God..because He works all things together for the good..
Love never keeps a record of wrongs..we too must forgive…especially if WE have been offended. This was such good advice!! Thanks for sharing it. I followed you over from Rich Faith Rising. Hi Judith! Thank you so much for stopping by! I’m glad that the post ministered to your heart.. 🙂 Blessings! This is so helpful to me! Thanks! I love your heart, Shari.